The PPS23 keychain model is a special edition version of our popular PPS23 series. For this special limited edition unit, in addition to the colors available, we've included a keyring and a bag clip. We believe this unit is the ultimate personal alarm for purses, backpacks, and car keys. The PPS23 is a dual function emergency attack alarm. It features a 130dB alarm, which is one of the loudest personal alarms sold by Vigilant. It is also the only alarm sold by Vigilant to include a backup feature – it has a security screamer whistle built into the end of the alarm that serves as an emergency backup alert mechanism in the event of battery failure. The alarm is activated by depressing the button on the front of the alarm, but a different button on the back of the unit is the only way to deactivate and silence the alarm. In situations where seconds make a difference between life and death – the ease of activation combined with the “hidden” off button make this alarm an easy to use, and hard to defeat personal alarm. MACE is a registered trademark of Mace Security International, Inc. All images and advertising copy 2017/2018. PURSE / BAG / KEY RING CLIP: Key ring with purse / bag / backpack clip – the ultimate personal protection alarm to carry on your purse or backpack. 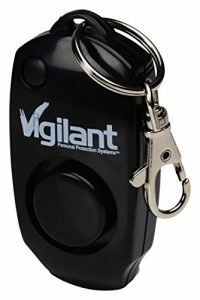 It is the #1 Vigilant alarm for attaching to your keys. HEAVY DUTY BATTERIES: Preloaded with heavy duty alkaline (LR44) watch batteries, user replaceable and 365 day standby time. You can find replacement batteries at any drugstore. VIGILANT WARRANTY: Vigilant alarms come with a full 1 YEAR WARRANTY. We're a Florida, USA based company with employees and product manufacturing in America and China. All Vigilant pepper spray is manufactured in the United States. Our alarms are designed in the United States and manufactured in China.